Every fifteen years, trouble comes after the Slocumb women. Now, as their youngest turns fifteen, a long-hidden grave is unearthed in the backyard. Headstrong young Mosey Slocumb is determined to find out who used their yard as a make-shift cemetery, and why. What she learns could cost her family everything. As forty-five year old Ginny fights to protect Mosey from the truth, she’s thrown back into the arms of the long-lost---and married---love of her life. Between them is Liza, silenced by a stroke, with the answers trapped inside her. To survive Liza's secrets and Mosey's insistent adventures, Ginny must learn to trust the love that braids the strands of their past---and stop at nothing to defend their future. I LOVED this novel. I laughed. I chocked up. I grinned. I cried. I giggled. 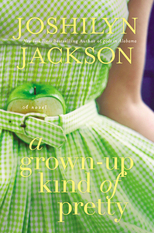 A Grown Up Kind of Pretty has everything I love in a novel – a unpredictable plot, emotion that leaps off the pages and characters as real and believable as the person sitting next to me. An ode to the bonds of family, regardless of its makeup, and the enduring strength of women, A Grown up Kind of Pretty is a compelling page turner that will keep you up late at night. Narrated via alternating viewpoints of three main characters, each of which delivers a sucker punch to the heart, Big, Liza and Mosey reveal that not all families are perfect and immerse us into their lives full of secrets that all three generations of Slocumb women are desperate to keep from each other and the outside world. Although not able to directly relate to their circumstances, life in the South, or the strife they have suffered through, I could sympathize and somehow relate and really, really liked each character even though I didn’t always agree with their choices. They were all deliciously flawed, utterly likeable and will remain with me long after I finished the last sentence. Initially I was wary of Liza’s viewpoint with her limited speech capability and her wandering thoughts, but Jackson did a marvelous job at conveying her disability, frustration and compulsion to communicate and protect her daughter regardless of her limitations. Both Liza and Big’s love for Mosey made the hair on my arms stand up and Mosey’s confusion surrounding the secrets she uncovers and her identity made my heart ache as did Big’s rehabilitation efforts with Liza. The prose in this novel is brilliant. I loved reading each word and was amazed at how Jackson portrayed their characters so effortlessly and impeccably through their view of the world. Big was sharp, witty and wry, full of love, tenderness, compassion and wisdom. Liza was frustrated and tortured and stuck mainly in her mind of tortured memories and failed attempts to communicate while Mosey was a typical teenager, sarcastic, sullen, frustrated and annoyed with all adults in her world yet desperate to cling to them at the same time. These characters had some of the most fantastic and amusing observations I have ever read and this was in addition to the sparkling dialogue that snaps, crackles and pops between the women. Even the minor characters are well portrayed, essential to the story and won’t be easily forgotten. At times amusing, but mostly a compelling, gritty, and heart wrenching portrayal, A Grown Up Kind Of Pretty kept me on the edge of my seat. Every time I thought I had it figured out, Jackson threw in another twist and I downed this novel in two days. I can’t wait to explore more from Joshilyn Jackson. Make this your next book club pick. You won’t be disappointed. I've been hit or miss on this author's books. I either love them or only tolerate them...but I still keep picking them up. I think it might have something to do with the covers. They are all so...perfect! The covers are perfect! Hopefully this one will be a hit for you Jennie!